It may be a time in your life that you are either dreading or looking forward to wholeheartedly, but that big birthday, be it a 40th 50th, 60th. If you are one of those people that dreads each passing year and simply want to bury your head in the sand and ignore the annual ‘celebration’ then fine, but maybe you should embrace the inevitable and simply enjoy it. Live with it and celebrate it, don’t fight it. One way you can do just that is by arranging for a special event to mark your milestone, and with plenty of places in Horsham to do just that, why not just make a start and get on with it? The chances are that a surprisingly large number of people will be more than happy to share in your happy celebration, not just because they like you but because everybody loves a great birthday bash. Some drinks, some music, some badly worded and slurred toasts and some embarrassing dancing will all help make for a splendid night, making those advancing years not feel so bad. But what about the food? It’s that age old question. Just how do you ensure that the food is going to match the event? It’s not easy and, if you’re not careful, it can be a disaster. If you are serious about getting old in style then why not get serious about your party food and book a hog roast Horsham caterer to delight then guests at your event? Choosing a hog roast hire Horsham chef can prove to be the light at the end of the tunnel for almost any special event. Whether a birthday, corporate event, wedding, anniversary or christening, choosing the hog roast hire Horsham option will be a masterstroke. There are so many pluses for choosing a hog roast hire Horsham event that it really does make you think why people don’t choose hog roast more often when planning special event catering. Thankfully, it looks like hog roast is becoming increasingly popular at events across the UK, and here’s why. Hog roast is versatile. Okay so you have decided to go with a birthday bash and those are almost always light hearted fun affairs, often with a bit of fancy dress thrown in for good comedic measure. Hog roast rolls are great for this style of event in Horsham. Rolls are easy to eat, you can stand and have a roll in one hand and a drink in the other, if you so fancy. What’s more, hog roast rolls are tasty and satisfying, unlike your typical party sandwiches which can be bland and decidedly lacklustre. But some birthday events may require a bit more culinary decorum. Maybe the guests are older or it is a society birthday that needs something a little more formal? If so then your hog roast Horsham chef can quite easily meet this need, too. Hog roast is delicious as a sit down meal and it can look fantastic satisfying this need. Beautifully carved and served alongside the obligatory crackling, hog roast is a classy meal that is loved by almost everyone. 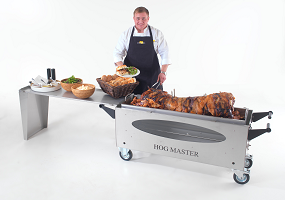 There’s a few other reasons why hog roast should get your vote as the food star of your party. Hog roast is a really good value option. Everyone knows that the food at an event is one of the most expensive elements, so if you can save money on this yet still provide great tasting food, you are onto a winner. Hog roast certainly allows you to do just that. The hog roast chef will be able to carve off enough meat of that great looking whole pig to feed over a hundred Horsham party-goers. Maybe you want to check that invite list because, with hog roast on the menu, there will be plenty of food to go around. Of course, there is no point in mulling over the pros and cons of whether to choose hog roast for your Horsham event if it doesn’t really taste brilliant. You do want to wow your guests after all. Well, there is no need to worry about letting people down in that respect because hog roast is a top performer when it comes to flavour. If you want traditional, freshly cooked, wholesome pork favours that taste truly scrumptious then you really are left with just the one option and that is hog roast. So, don’t dread that big birthday, embrace it and celebrate with the rest of your friends and family by booking a Taste the Cracklin hog roast.